Kingfisher01263 715779work01603 870304fax Self-cateringKingfisher is a recently converted barn situated in rural countryside and acres of fields surrounding the property and other barns on the site. It has exceptional accommodation for a group of four people and the benefit of shared use of an additional barn with games to enjoy. 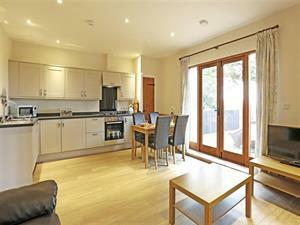 Rooms: 2 bedrooms (1 en-suite) open plan room with sitting/kitchen/dining area, 1 bathroom. Beds: 1 super king which can be made into twin beds, 1 twin bedded room which can made into a super king size bed (please specify your preference at the time of booking). Outdoors: Shared communal barn with TV, games console, books and games, soft furnishings. Private gravelled garden with table and chairs. Communal garden with large pond where children must be supervised. Kingfisher is a recently converted barn situated in rural countryside and acres of fields surrounding the property and other barns on the site. It has exceptional accommodation for a group of four people and the benefit of shared use of an additional barn with games to enjoy.